Why would somebody forgo juicy steaks, delicate smoked salmon, velvety goat cheese, and the many seemingly delicious foods people eat? Why would somebody choose to submit themselves to the inconvenience of not being able to eat outside of their home without some advanced planning? Why would they refuse to wear products widely seen as fashionable and insist on knowing what their hygiene products are made of? Why would anybody be vegan? As I write, we find ourselves living in a time widely referred to as the Anthropocene. This is an age in which human actions present a major threat to life on earth and are understood to have already fundamentally altered the geosphere (see Kohn 2014; Zylinska 2014). According to numerous studies and reports, one of the biggest contributors to climate change is the livestock industry; it is an industry that, per year, produces greenhouse gases roughly equivalent to those produced by all cars, trains, planes, and ships combined. In addition to the environmental degradation caused by the livestock industry, it is, by its very nature, an industry that involves the killing of other species and the suffering of non-human animals. Recently, multispecies ethnographies have demonstrated the necessity of being mindful of species other than ourselves and cognizant towards the “effects of our entanglements with other kinds of living selves” (Kohn 2007:4; see also Kirksey and Helmreich 2010). Veganism is one practice in which problems related to the livestock industry are brought to the fore. It is a practice in which human and non-human animal relations are refigured, and according to numerous scientific and governmental reports, the diet with the lowest average carbon footprint. As a fast growing minority practice with the potential to address climate change and the ills of the livestock industry, veganism represents a key topic for anthropological inquiry. For my master’s dissertation, I examined the lives, everyday experiences and actions of individuals in the London Vegan Community. This was a community whose members were extremely active, online and offline. My participants’ interactions traversed social media and offline spaces, these seemingly separate spaces were deeply intertwined. London Vegans regularly interact on Facebook (i.e. London Drooling Vegans), on Instagram, and in a What’s App group. 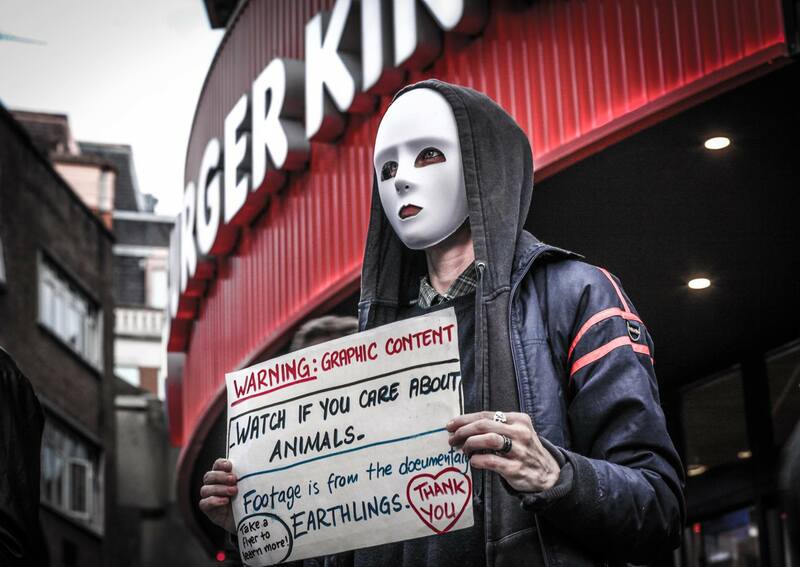 They use these platforms for online discussion and to organize in-person gatherings—ranging from purely social events that usually revolved around eating, to activist events like The Earthlings Experience (image below). In my analysis I consider why individuals practice veganism and following the recent ‘ethical turn’ in anthropology, I ground discussion of ethics in the empirical. Ethics is not marked by obligation or pure reasoned thought, but by subjectivation—the process of striving to fulfill a subject position (Foucault 1985, 10-11). Veganism is both the subject position my participants strive towards and represents the practices they undertake to reach this subject position. For participants, veganism concerns rationality, compassion and caring. Their practices represent techniques of the self, through which they cultivate and enact dispositions necessary to become the subjects they strive towards; this disposition is one of awareness and sensitivity to the material world. London Vegans’ practices collapse the distinction between means and ends, resembling the Aristotelean concept of actuality (energia), in which the end is manifest in the action itself (Arendt 1998, 206-207). Within the lives of London Vegans, social media represent vital tools for ethical subjectivation. On social media participants engage in regular deliberation; they often post explanations, memes, and cartoons about veganism, share links to articles and YouTube videos about veganism, and post images of food alluding to vegan justifications (see examples below). These posts are carried out for various reasons, with a major motivation being to convince others to “Go Vegan!” When posting, participants are conscious of common criticisms against veganism: that it is too hard, that vegan food is bland, that it is expensive, and that the diet is nutrient deficient. Their social media posts allude to these critiques and strive to discredit them. There is an undeniable practical component to my participants’ social media usage. They describe the hardest part of going vegan as figuring out what constitutes a meal, relying on social media for ideas and information on nutrition. Participants follow vegan food accounts and accounts like @vegansofldn in order to learn about places to eat throughout London. In using social media, they also become more secure in speaking with omnis (how participants referred to non-vegans). Using social media, participants develop skills and knowledge needed to lead a vegan lifestyle. Vegan social media are also productive of an alternative atmosphere of affect that is conducive to vegan practice. For participants, being sensitive to and aware of connections between seemingly lifeless objects and once living animals is vital to being vegan. The cultivation of material sensitivity is a key components of vegan subjectivation. Their practice of veganism is deeply intertwined with the material world; it necessitates an intimate relationship with and knowledge of one’s material surroundings. Participants attune their senses to both disgust and pleasure in seemingly everyday objects; their senses are not the result of chance, but training. The association between animal products and disgust is maintained through social media. In habitually viewing images of animal cruelty, vegan arguments, and deploying vivid language to discuss non-vegan items (not hamburgers but “dead cow flesh,” not milk but “a glass of blood and cow pus”) participants cultivate a specific affective disposition—namely extreme physical and emotional displeasure in encounters with non-vegan objects. Participants’ disposition is not just characterized by the tendency to experience negative feelings in encounters with animal products, but also feelings of pleasure in encounters with vegan objects. London Vegans experience joy when they view images of vegan food, post photographs of meals, and see posts about vegan events and restaurants. These joyful affects are helpful in the continuation of vegan practice. While walking through the city and going about their lives, participants frequently document the world by taking photographs and sharing on social media. When they encounter distasteful objects or experiences, like a sign promoting animal products, they do not ignore it, but engage with it. When participants encounter joyful objects, like a new vegan option at a restaurant, they share that information with others. As they engage in documentation, mundane objects and routine actions are reaffirmed as worthy of ethical concern. Marres (2015) describes that the act of recording material practices ‘enables fascination with everyday substances—bringing out moral capacities’ (96). The presence of various social media is a constitutive feature of the the affective atmosphere. Using social media, my participants establish the affective atmosphere of London as a site of ethical action. London Vegans’ practices are recursive, as they are ‘concerned with the practical maintenance of the means of their own existence, and speak to existing structures through the creation of actual alternatives’ (Kelty 2006, 3). 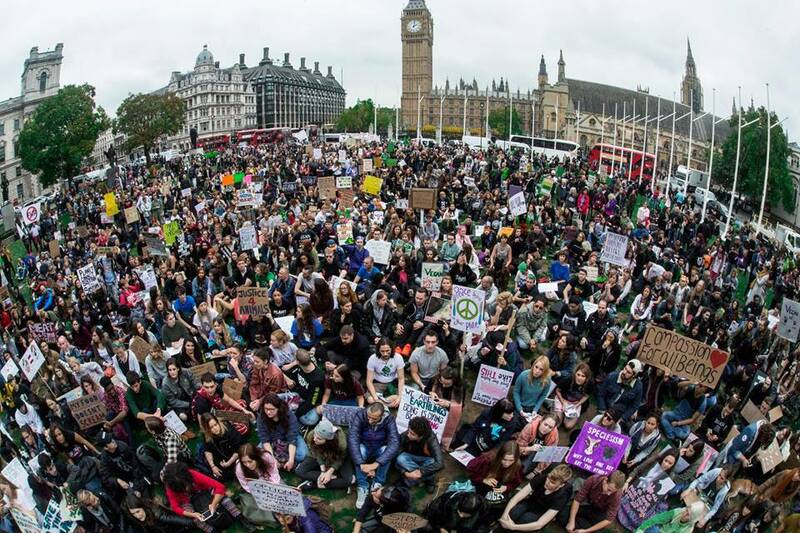 London Vegans’ usage of social media is a means through which they contest the status quo of consuming animal products, while also developing the necessary practical skills, knowledge, relationships, and affective conditions conducive to living a vegan life. Importantly, I contend my participants’ cultivation of awareness and sensitivity is political. Bennett (2010) remarks that “bodily disciplines through which ethical sensibilities […] are formed and reformed are themselves political and constitute a whole (unexplored) field of micropolitics” (xii). According to Bennett, political and social projects (i.e. environmental conservation) will be unsuccessful “without human dispositions […] hospitable to these effects” (ibid.). Arendt, H. 1998. The Human Condition. Chicago: University of Chicago Press. Foucault, M. 1985. The History of Sexuality. Volume II. The Use of Pleasure. R. Hurley (tans.). New York: Pantheon. Kelty, C. 2006. Two Bits: The Cultural Significance of Free Software. Durham: Duke University Press. Kirksey, E., and Helmreich, S. 2010. The Emergence of Multispecies Ethnography. Cultural Anthropology, 25 (4). 545–576. Kohn, E. 2007. How Dogs Dream: Amazonian Natures and the Politics of Transspecies Engagement. American Ethnologist, 34 (1): 3-24. Kohn, E. 2014. Toward an ethical practice in the Anthropocene. Hau Journal of Ethnographic Theory, 4 (1). Marres, N. 2013. Material Participation. Hampshire, England: Palgrave Macmillan. Zylinska, J. 2014. Minimal Ethics for the Anthropocene. Ann Arbor: Open Humanities Press.